Changing the primary domain your Store is accessible at is quite an easy job with the capability of PrestaShop to perform that change with a simple edit for one of the fields in the Store’s admin backend. In this tutorial we will illustrate how to change the domain name of your Store easily, safely and without a single drop of downtime or inconvenience. First we will begin with an optional step. If you would like to avoid any inconvenience for your customers you should put your store in maintenance mode. If you are not aware how this should be done please check our other tutorial on that matter. 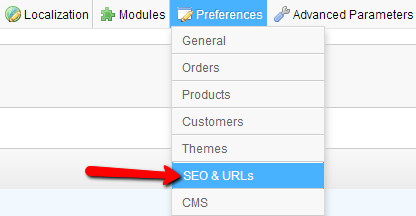 As soon as your Store is in maintenance mode please access your Store’s admin backend > Preferences > SEO & URLs. This will redirect you to already familiar page if you have checked out tutorials for the configuration of SEO URLs and changing the installation folder of your website. SSL domain – The domain name that should be used for the SSL supporting pages. The value of this field should be the same as the previous one if of course you would like to have a different domain for your SSL certificate. Base URL – the value of this field should remain unchanged when you are changing the domain name of your Store only. This field is used if your Store is installed in a subfolder and the name of the subfolder should be in this field. Once you are done with the changes please press the Save button located in the action bar above the Set up URLs interface so your changes can be saved. Please note that your web-site and admin area will be then accessible with the new domain name. You will need to disable the maintenance mode as a final step so your Store can be visible at the new domain name you have changed to. Congratulations! You can now change the domain of your Store!